Caffè Amore | A critical and personal blog about the lifestyle of good Caffè, preferably enjoyed at an adequate price and a nice location. 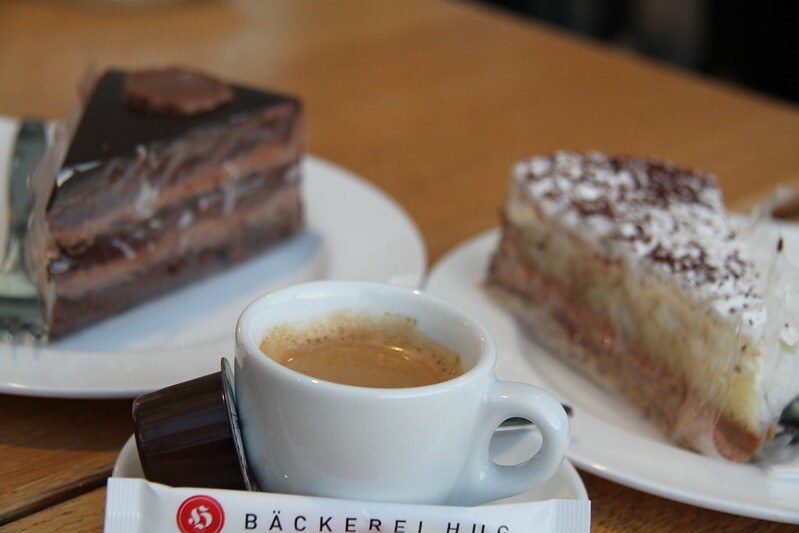 The Café Glueck opened last fall in Meilen and gave the town a Café which offers a cozy and stylish break from it all. Their Coffee is above average, I would even go as far as state that they have the Best Coffee between Tiefenbrunnen and Rapperswil. The Torta Della Nonna is one of my favourite sweets to enjoy with a Coffee and theirs is, though a little too moist, quite close to perfection. Prices are fairly high. And the biggest drawback is that they are not open on sundays! I sure hope this will change soon…? The staff are very kind and attentive. Combining this fact with the quality of the coffee I award 8 out of 10 Stars. I’ ll return soon to make sure they keep up the good work! their own, people come here because of the honest and good quality of their food and coffee. 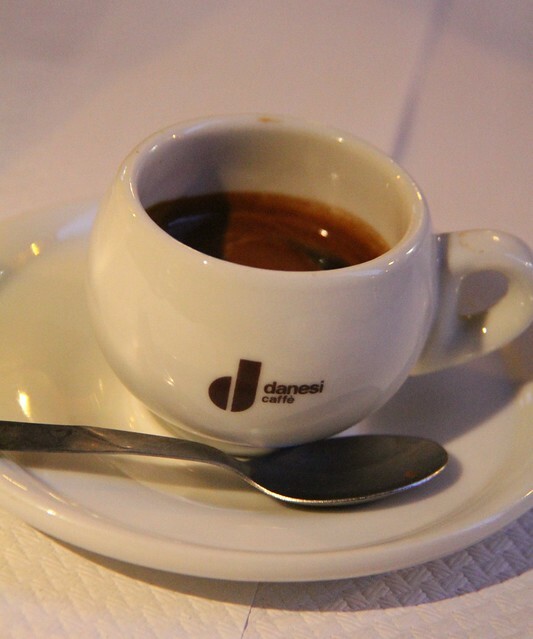 They use Dallucci Caffè, which is quite popular in Rome. The Espresso was well-balanced, and had a medium strength body, slight sour note and the flavour lasted for a bit after drinking it. I never would have dreamed of adding cream to that coffee, and I absolutely NEVER add sugar (regardless of how bitter the brew might be). 8 Stars for the Espresso. We were on a family trip in Zug one day and went to the Conditorei Schlüssel in Menzingen. Even on the darkest winter afternoon, their pastries have a way of cheering you up! The waitors are very friendly, and the ambiente is nice. They even serve “Italian Espresso”, which was surprisingly good for a pastry shop (for their specialties usually are their baked goods). Here, I was positively surprised. 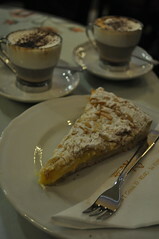 7.5 stars for the Espresso, and a bonus point for their great assortment of cakes, pastries and truffes. I am sure to return one day! I was also slightly crestfallen at the average level of quality for coffee in our country. More often than not, I am forced to add cream to my coffee, or worse, am compelled to eat a sweet with it to bear drinking a coffee which is unbalanced to say the least, and bitter, to be blunt. There are exceptions to this unfortunate conclusion, like the Cafés I complimented on this blog before and which you are more than welcome to check out in my “best rated cafés” category. Those Cafés are still an exception, however. The Trattoria Da Maria in Capalbio, which is in the southern part of Tuscany. It has become a family tradition to stop by the Trattoria on our way home after our holiday on the Isola Del Giglio. They make their own pasta, there is even a window in the kitchen so you can watch them do their magic. And following a delicious meal, we enjoyed the best coffee of 2012! They have their own “mischela”, which is being roasted by a small family roast house in Viterbo. 9 stars for the Espresso! It is also the exception to the rule which says that, most unfortunately, every restaurant I enjoyed a delicious haute cuisine meal in would have had a great rating for the food, if you did not include the coffee. It turns out to be of little importance to the managers of these restaurants, in total opposite of the food, which is of the utmost importance and no expense is spared to ensure its freshness and quality. The managers of these Restaurants might be familiar with the term “Barista”, but they are still not interested in hiring one to make sure their coffee is on the same level as their food. So the Trattoria Da Maria is a very welcome exception to this rule. May there be many more to follow in their footsteps! 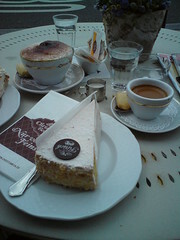 The Café Alpineum is located just next to the Gletschergarten near the Lion Monument in Lucerne. The ambiance is really nice, they also serve little meals. They use coffee roasted by Rast Kaffee, which is quite good. It is a bit on the bitter side for my taste, but the Espresso has a strong body and a little acid note. They offer lactose free milk, though no Sheep’ s milk. 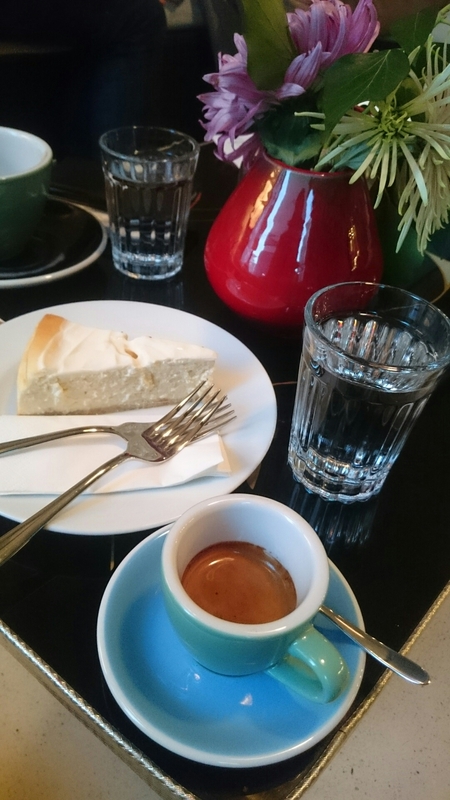 I discovered a new Café in Zürich, one I had heard about from several people, and found it was time I checked it out: Café Noir. They also roast their own coffee and some of the Cafés I featured on this blog use their freshly roasted black gold, among them the Café Miyuko. 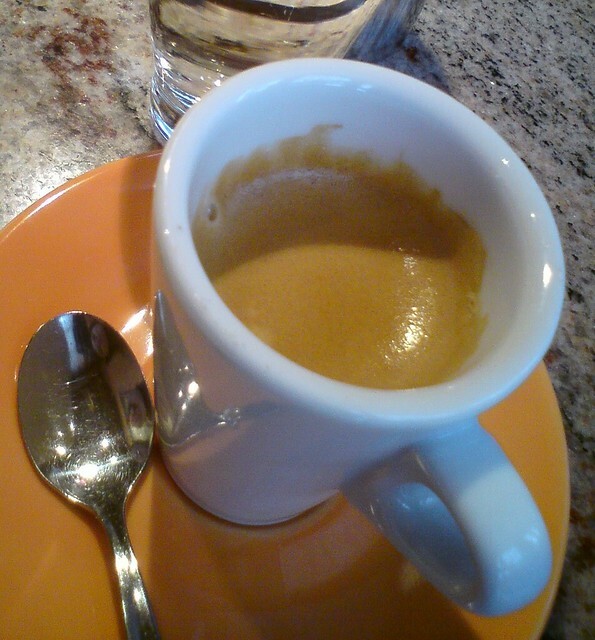 The Espresso seen here is their special Bio Fair Trade Arabica from Peru. I also tried their house roast blend, which I found agreeable, though different. I actually preferred the house roast to the Fair Trade Peru. They are both well-balanced, the house roast has left a more distinct memory of what it tasted like, the Fair Trade is less special. Price: Fr. 3.80. I spoke to the Barista and asked him what they offered in terms of lactose free products. He said they sometimes have lactose free milk, but not always. I suggested they try sheep’ s milk, and he said they will consider it. I will return to learn if they have actually tried it. I hope so! 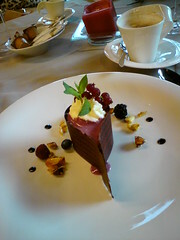 By the way: The chocolate cake was very good: moist, and not too heavy, but real chocolate taste! Just as it should be! The Espressos get 8 out of 10 Stars! I’ ve been incredibly busy working, so I apologize for not having posted for so long. However, this café is a new discovery, shown to me by a friend of mine. It is called Café für Dich and is located at the Langstrasse, near the Bäckeranlage.The Café combines everything I look for in such an establishment: friendly staff, beautifully decorated interior, you can sit outside when it’ s warm enough and are not disturbed by the noise, for the tables outside are in a little side street. And, of course, most importantly, the coffee is good. They also offer their lattes, Cappuccinos etc. with Soy milk, which is essential. 7.5 Stars for Café für Dich! What do you think about this Café? Have you been there? Please comment below! The last few days have been monsoon-like, there was no trace of summer. Until today. 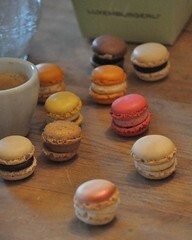 Macarons are great with coffee, they lighten up the day or improve it even more if the weather happens to be good. 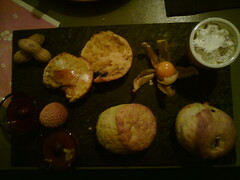 Those on the picture aren’ t just random Macarons, they are the best there are: Luxemburgerli by Sprüngli. If you’ ve ever tried them, you won’ t forget their unique taste and look. They also have special editions, this time they had a Bellini-flavour (you know, Venice’ s official drink, consisting of peach puree and prosecco). It’ s delicious! For those who prefer the creamy flavors, let me make a few suggestions: marc de champagne (my favourite), chocolate and caramel with fleur de sel. Delizioso! 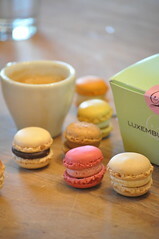 So now that summer apparently has arrived, a coffee with a Luxemburgerli on the terrace sounds like heaven, doesn’ t it? 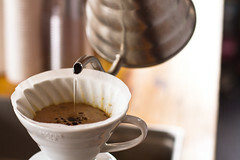 Check out the sweets page for more ideas as to what sweets you could try with coffee. And to complete the collection, here’ s my other favourite baked good from the Christen Beck: the Strawberry Tarte, with 5 layers: puff pastry, then dark chocolate, vanilla pudding, whipped cream and strawberries. Just like my Birthday cake. The only think I don’ t like is the (unfortunately common) layer of fruit gelatine. For a review of the coffe, check the previous post. Beckenried is a beautiful village at the shore of Lake Lucerne. It is the perfect place to spend a sunday afternoon, and you can get there by a mundane paddlesteamer. But it gets even better once you’ ve arrived: there, the Christen Beck awaits! 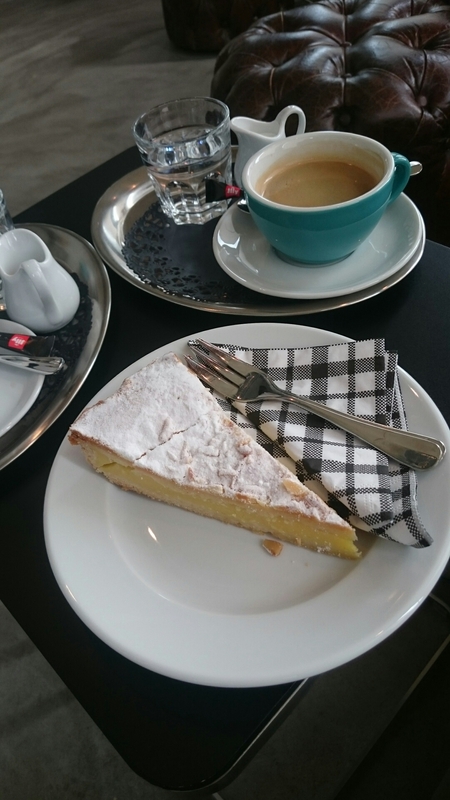 Their baked goods are so tasty I don’ t even know what to recommend most, but I picked two of my favorites: one, the Kirschtorte, a swiss specialty. It’ s exquisite! Two: the strawberry tarte. And, of course: the coffee is great, too! 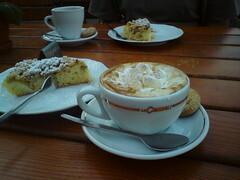 The schiuma of the Cappuccino looks pretty good, and I’ m told it tastes as it looks. 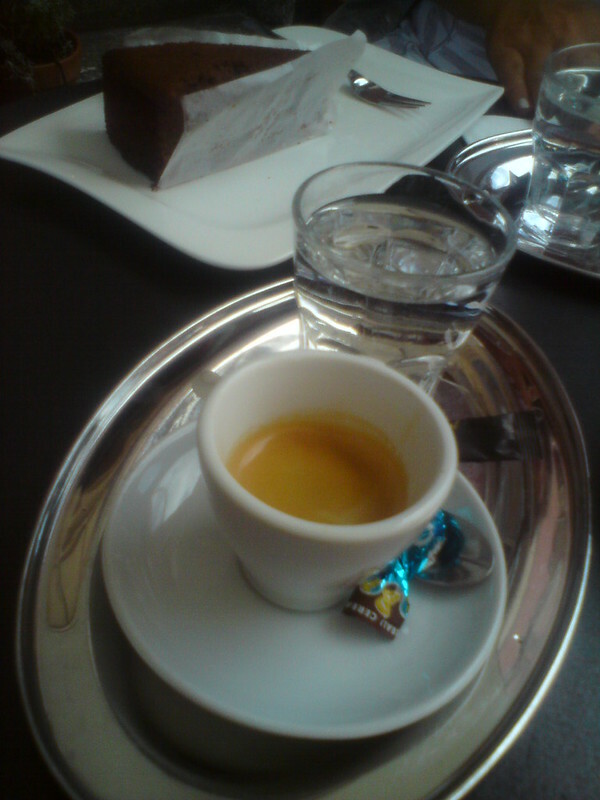 The Espresso is well-balanced and altought their strong suit is the baked goods, the coffee is well above average. 7 Stars for the Espresso and cappuccino, 9 Stars for the exquisite baked goods! Pascucci has started the mobile coffee project called “Coppolini”. They have stations on various train stations in Zürich, such as Stadelhofen, Oerlikon, Enge and are also present on Letzigrund stadium. For a complete and updated list of stations visit their website. They use the Pascucci coffee, which is very high quality. I tried the Espresso, which is very well-balanced. The barista was friendly, too. 7.5 Stars for the Espresso. It cost CHF 3.50. That’ s reasonable for Switzerland, and a bargain for Zürich. 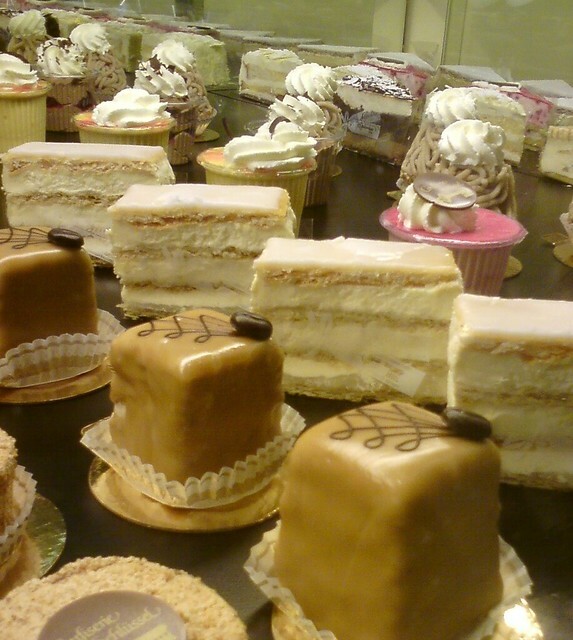 The only thing missing for me was something small and sweet, like Amarettini, Tartufi, Bacetti, Cantucci or the like. That would make it the perfect spot for my coffee to go! 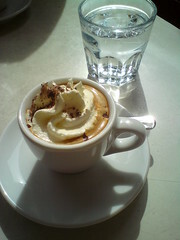 I promised you a positive example of a Caffè con Panna, which is an Espresso with a LITTLE whipped cream on top. The ratio of cream and coffee is very important. 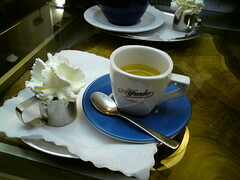 If there is too much whipped cream, the Espresso is cold by the time you get to it. I miss the Ruanda Burmera Cup of Excellence (COE) at Henrici, by the way. Hope Tito discovers equally good coffee gems in Costa Rica! Can’ t wait to try them. 8 Stars for the Ruanda Burmera COE. I don’ t mean to be harsh, but I was really upset by the relation of price and quality of this Ristorante. It was the Ristorante da Ernesto in Lucerne. It is located directly at the Reuss, which explains why they get away with such mediocre products. People pay for the view. It’ s just like the Rathaus Café at the Limmatquai in Zürich. Same difference! 6 Stars for the Espresso and Espresso con Panna. 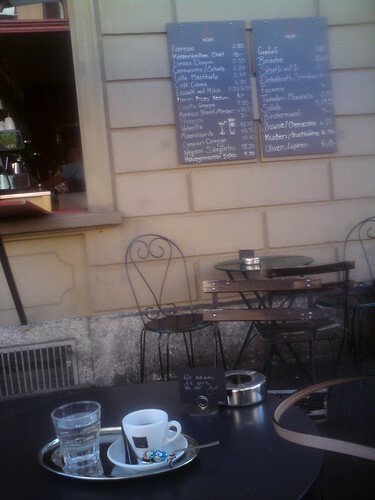 Please, if anyone knows a decent Café in Lucerne, let me know! Comments are very welcome! 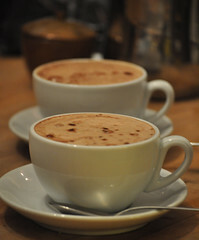 What winter-related coffee recipes do you know, or at which place have you tasted such a creation? Please comment below! The other tuesday we were in Ticino to catch some sun. 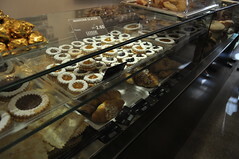 The pasticceria Gabbani caught our eye because of the gorgeous-looking bread and pasticceria they had on their shelves. Then we noticed they had a Café, too. Naturally we had to try the coffee. It was delicious, and the price-quality ratio is exceptionally good! 8 Stars for the Espresso. It cost only CHF 2.40. To add to that, they offer 20 percent off on every tuesday on everything you buy to go, and that included the pasticceria. Their cornetti truly taste like the good ones you get in a classic Italian Bar. We will definetely return! 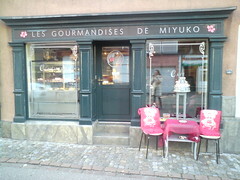 The café Miyuko (located at the Beckenhofstrasse, near the tram station “Beckenhof”) is one of the gems I recently discovered in Zürich. There are not many cafés I would describe like this . Miyuko, however, stands out from most of the other cafés with very carefully chosen and prepared sweets and snacks, you can even have a light lunch (they offer soups and warm and cold sandwiches). As I’ ve told you before, I LOVE scones. The ones on the picture are very close to perfect, and they are gluten free, lactose free and vegan. (you can also have them in normal, for those who don’ t suffer from those allergies). There was one with pumpkin seed, one with raisins and one with sencha (green tea). They were served with guava and strawberry jam. Although it takes some getting used to at first, those exotic flavours really are delicious and the combinations form a good symb iosis. 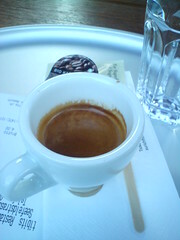 I also tried the Espresso, which they get from Café Noir (a small roasting facility in Zürich). I liked it, it’ s quite well-balanced, a little on the sour side (which doesn’ t bother me), but the taste is not as long-lasting as it could be. 7.5 Stars for the Espresso. The homemade pralines they serve with it, especially the one with cinnamon and dark chocolate, is extraordinary! So is the engagement of the owners who also run the place. I’ ll be back! The WordPress.com stats helper monkeys prepared a 2011 annual report for this blog. Thank you again for visiting my blog! See you in 2012! Happy New Year, dear coffee lovers! To celebrate the beginning of 2012 (which, I hope, will coffee-wise be a diversified, tastewise interesting year), let me introduce you to a coffee gem I stumbled upon: the Single Origin Espresso from the south of India. 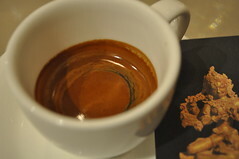 I enjoyed this outstanding Espresso at Café Trussardi in Milano. It has a strong, balanced body and its taste lasts long. It truly was a positive surprise! 8 Stars! Thanks to everyone who has visited my blog and thanks especially to the active users who have taken the time to comment! I truly appreciate your input and I’ m looking forward to the new year, hoping to see you all on my blog again! Til then, happy new year everyone! Happy Holidays, dear coffee lovers! 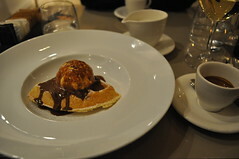 I thought I ‘ d update the “sweets” page on this blog, and I found a nice addition in this delicious wafle with vanilla ice cream and chocolate sauce. 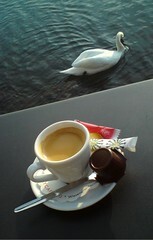 I enjoyed it with an exquisite Espresso at the Café Trussardi in Milano. Read more about the Espresso in the post above. The perfect sweet to enjoy with a strong Espresso or Macchiato is the classical Torta Della Nonna, which is made with pignoli. It also has a slight note of vanilla and lemon. Try it next time you’ re in Italy! 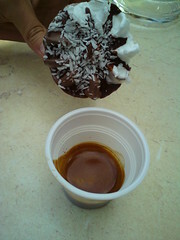 For more sweets, check the page “the perfect sweet to enjoy with a coffee“. There are quite a few coffee specialities I have never introduced you to, one of the classic ones is the Marocchino: it is like a caffé Macchiato, only with some chocolate added to the coffee before pouring the milk foam on top. Now that I enjoyed such a great Marocchino as the one on the picture, I thought it is high time to share this exquisite speciality with you. I enjoyed it at the Bar Grossi in Milano. We had a fantastic Torta Della Nonna with it, which made it even more memorable. 7.5 Stars! E tanti saluti ai Baristi del Bar Grossi! A presto! For a couple of weeks, Henrici has been offering the filter coffee, which is brewed by the customer at the table. They use a single origin coffee which might change from time to time, at the moment they offer the “Cascada” single origin coffee from Guatemala. It has a solid, rather mild body and a slight acid note, ending with a smooth aftertaste. I congratulate Henrici for their innovative spirits and think it is great that the costumers can experience the brewing of the coffee. However, for me it would be a bit too complicated to brew my own coffee everytime I visit Henrici, and I’ m looking forward to the single origin Espresso which they haven’ t offered these past weeks, but which should be back soon (they promised). 8 Stars for the “Cascada” filter coffee! Here’ s the other Occhio Di bue. I leave it up to you to compare it visually to the one from the Bar Da Fausto (see previous post). The two Bars are about 50m apart, so I would recommend to try both. 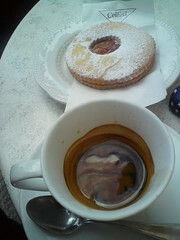 In my opinion, this Occhio Di Bue is better, the pastry is thinner and there isn’ t too much marmalade on it. And the Caffè is better, too. 8 Stars for the Espresso! 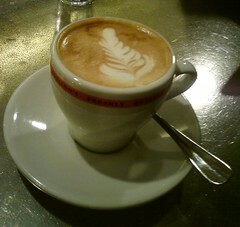 It’ s time to share with you some great coffee experiences after some rather disappointing ones. 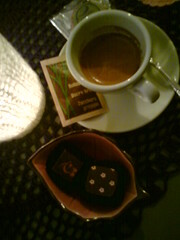 This Macchiato and Occhio di bue (“bull’ s eye”) were enjoyed at Giglio Porto al Bar Da Fausto. Even though the Occhio Di Bue isn’ t especially good, the Macchiato really is ok. Porto is good if you want to enjoy the morning sun. There are some beautiful beaches there, too (Canelle for instance). 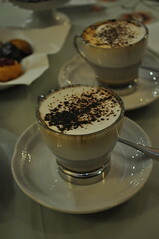 7 Stars for the Macchiato! 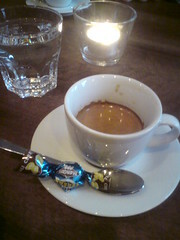 This is an example of a mediocre Espresso as there are loads in Restaurants. They focus on their food and don’ t want to spend money on coffee and also on people who have knowledge of what makes a good Espresso. How very sad! The Espresso was way too bitter to drink without a sweet. That’ s not a good sign. The Price of CHF 4 is also quite high, considering it is a self service Restaurant. product as the quality and roast of the beans. Because of the fact that most of the staff of these cafés-I call them tourist cafés-don’ t know how to get the best possible result out of the coffee and machine they’ ve got to work with, I’ m grateful if they give me some whipped cream with the coffee. Luckily, they did 🙂 The Espresso cost €2.30 and gets 6 out of 10 Stars. I was in Maccagno on the east coast of Lago Maggiore recently, which is in Italy but quite close to the Swiss border. You have a bit of the swiss precision and accuracy, but you also have great Italian stile di vita, which includes coffee. 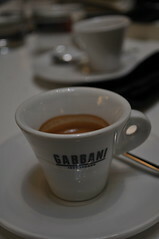 This Espresso, or caffè, as the Italians call it, cost €1 and tasted fantastic. 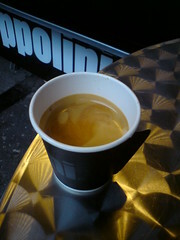 I admit it doesn’ t look too elegant in the plastic cup, but the taste does make up for it completely. I enjoyed it at the Bar next to the Campeggio. 7.5 Stars! Since I’ ve never featured a Cappuccino con Panna on Caffè Amore before and I rather enjoyed this one, I thought this is the opportunity to introduce this italian speciality to all of you who don’ t know what it entails exactly. Normally, a Cappuccino con Panna consists of Espresso with foamed milk (like a normal Cappuccino) and the panna (italian for whipped cream) is added on top. 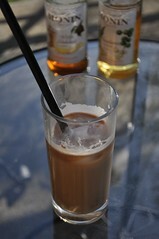 This one was created just with coffee and panna, so it is actually more of a Mélange, like the Viennese drink it. Since I can’ t drink milk anymore (but cream is ok every now and then) I decided to try this coffee just with whipped cream. The coffee was rather strong, but quite well-balanced. The cream gave it that soft touch. The Rhubarb crumble was also very good. I enjoyed this afternoon break coming down from the Löwenburg in the Rheinland (near Cologne), at the Restaurant Löwenburg. Prices were acceptable. A 6.5 for the Mélange! It’s Raspberry time, which means my favourite season because I’m absolutely in love with berries as they are sweet and are the perfect topping to a cake! 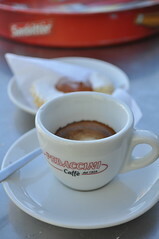 And they sweeten your tongue for a strong Espresso or a Macchiato with sheep’s milk, such as this one. It’ s a perfect combination! 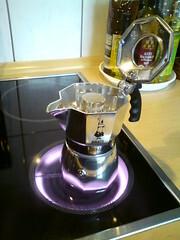 Whenever I’ m in Germany and in search of a good café I go for the ones that have an italian touch, because-let’ s face it-Italians are the masters in preparing coffee, it’ s in their blood. There are also a lot of Ice cream parlours in Germany, and most of those are run by Italians. Just like the one where we had the cafés on the photo. 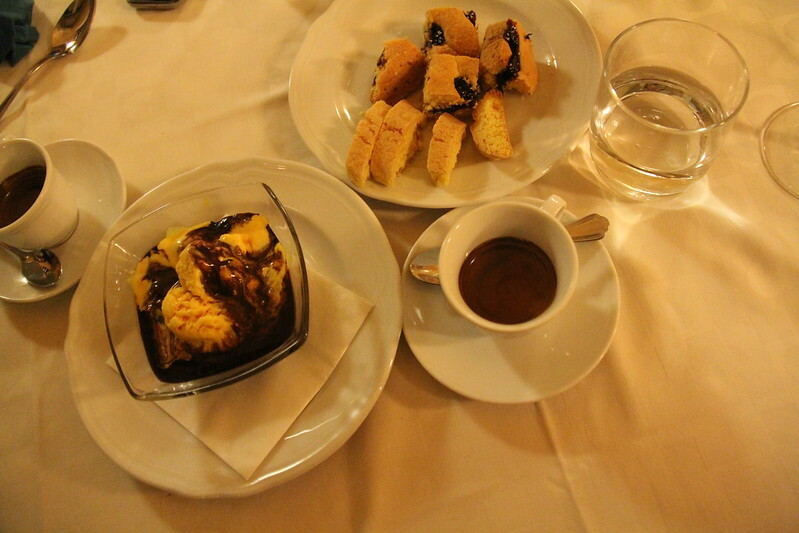 While the caffè were ok, but not extraordinary (6.5 Stars; prices: €1,70 for the Espresso, €1.90 for the Americano), the Ice cream was exquisite and we could have told that it’ s homemade just by tasting it. 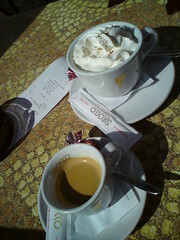 So improve your coffee, but please don’ t change the recipes for your ice cream! I’ ll return for sure! They also serve good macchiatos as you can see:-)I think this café deserves the honour of a double post: Tazza D’ Oro isn’ t my favourite café anymore, here’ s the new winner: Bar al 127, via Giulio Cesare 127, Roma.Forza caffé italiano! I’ ve never had such a perfect, strong, yet not bitter or sour coffee in my life! Tazza D’ oro is nothing compared to this! It’s true what I always thought: you get the best caffè in a quiet via, looking unparticular and unadvertised, the barista is up to his job and doesn’ t need any kind of promotion besides his coffee to prove it. When asked he confirmed he makes his own blend of coffee and his wife bakes the pastries they sell. It’ s simple, and it works. The cherry on top is the price: €1,20 for the Americano, which is what they call a caffé Lungo in Italy. 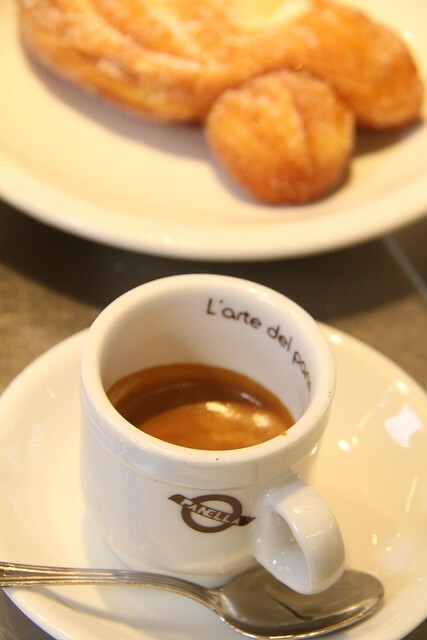 Here’ s the address to this place of coffee heaven:Bar al 127, Via Giulio Cesare 127, Roma. It’s right down the street from the Metro Station Ottaviano near the Vatican. 9 Stars for this marvellous caffè! 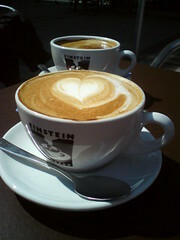 I enjoyed this lactose free Cappuccino at café Einstein in Cologne. 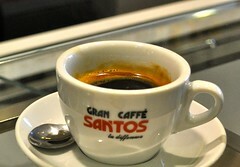 They use the Brasil Santos coffee, which is also available at other high standard cafés, like Schwarzenbach. Einstein has coffeeshops in Germany, Belgium and Egypt. I went to try one out finally because I had heard their coffee was good, and I agree. Although I am against supporting big coffee chains, I would visit one of Einstein’ s coffeeshops again if there wasn’ t another exceptionally good café in the vicinity. I did not like the lactose free milk, though. I wish cafés would offer cappuccino with sheep’ s milk! Many Baristi haven’ t even tried out this option, and I think it’ s high time they did! 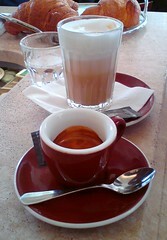 The prices were ok: €2,50 for the Americano and €3,10 for the Cappuccino. 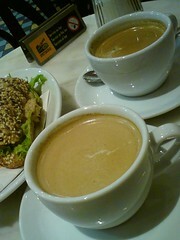 8 Stars for the Americano and the Cappuccino! The name of the café clearly is justified, as the lake is literally next to the café; it’ s actually situated at the boat station of Männedorf. The view from there is really amazing, so many people come here because of the location. The coffee is ok, but nothing special. I also go there mainly because of the location, or to have a nice hot chocolate or ice cream. 6 out of 10 Stars for the Espresso. Since I’ ll be in the area of Cologne and Bonn more often in the future, I’ ll have to keep my eyes open for good cafés there. After some truly disappointing experiences, for instance the fact that “Filterkaffee”, or the typical american coffee is still what you get when you ask for a cup of coffe in many Cafés that aren’ t located in the centre of a big town. This is one of the reasons why I was rather hopeful when I was made aware of the italian Eiscafé Tormen in the small town of Hennef. The Caffé Lungo really tasted good, although the crema was a little thin and vanished quickly. The gentleman accompanying me gave it a 7, I (since I compare it to the best I’ ve ever had and therefore it competing with several true Italian caffé) award it with 6.5 Stars. The waffles were really good, too. That’ s one thing I can say for the region: there’ s waffles on almost every corner (they’ re much harder to find in Swiss Cafés). As the photo indicates, the homemade sorbet in couverture is the true discovery at Restaurant Piccard, which is located at the Verkehrshaus Luzern. It was the coronation of a truely delicious meal. With it, I ordered a Cappuccino (at the right, in the slightly curved cup) and was a little disappointed. I’ ve had this experience quite a few times before: Going to a noble Restaurant, feeling fancy and enjoying a delicious meal and being disappointed by the coffee. 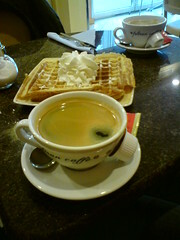 I think it’ s a shame that in many Restaurants, coffee is considered a minor matter than the food that is being served. The ingredients for the dishes are being chosen with the utmost carefulness, but the owner often does not even know what kind of coffe he’ s serving. They still have normal or even higher prices for their coffee, though. For me, coffee is a stamp for a Café or Restaurant. If I don’ t like the coffee, I’ m not inclined to visit the place again. The alternative is accepting the fact that coffee is only being chosen and prepared carefully at cafés whith Baristi who are trained to prepare an exquisite coffee and not at Restaurants, and the consequence is to skip coffee after your delicious meal and go to a real café for that icing on the cake. What a shame! Returning to normal cafés after the heavenly experience of Barista Championships is hard..I find I’ m getting pickier by the week in choosing where I’ ll have my coffee if I’ m not at one of my favourite places. Anyway, my job is to find new ones that convince me with their atmosphere, friendly staff and good coffee creations. As is the Caffé Spettaccolo (a coffee chain, but a small one with italian charm). They have three different roasts of coffee: mild, medium and dark. The mild one also tastes as the name suggests, the medium has more body and a slightly stronger aroma, but the most intense in terms of taste and body certainly is the dark roast (at the back). The Tuna Sandwich is, as their other snacks, very good; so are their italian Amaretti!!! They have local branches in several swiss cities, and with a Caffé Spettaccolo at Zürich Airport it is made sure you get a decent coffee before flying out or after landing. Without it, your alternatives are quite dull (I recently ordered a normal coffee at Starbucks-threw it away after one and a half sips!). 7.5 Stars for the caffé at Spettacolo for consistent quality, italian charm and always saving me when I’ m at the airport!! Just look at that Cappuccino and assume it’ s as good as it looks. Wouldn’ t you be in coffee heaven? I was. All those great and extremely talented Baristi creating their specialities and a well trained and competent jury judging every single one of their performance. We also asked some of the judges how they cope with the amount of the coffee they have to drink during such a short period of time. One answer I got was that the espressi were no problem, but the drinks containing milk were heavy on the stomach after a while. I definately understand that. And looking at the large number of talented Baristi in Bern, I’ m confident that the gastronomy will pick up on the high level of coffee served and demanded by that growing number of people who care what kind of coffee they are being served after a delicious meal in a noble restaurant, and that everything, from the age of the roasted coffee, to the coarseness setting of the machine and the machine itself and the Barista making the coffee, is harmonized. These factors strongly encourage more Cappuccino looking and tasting like this one. I’ m keeping my fingers crossed. 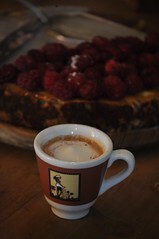 And many thanks to Martin Egger, Swiss Latte Art Champion 2010 for this Cappuccino. 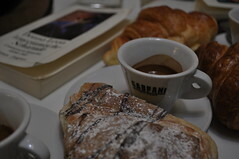 The Caffé Bicerin contains chocolate sauce (Gianduja) apart from milk and coffee. Unfortunately, not even the chocolate can make the soy taste of the milk less apparent. It’ s such a shame they don’ t use sheep’s milk as an alternative at Henrici. 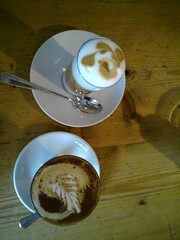 Apart from that, I’ m thrilled by their Baristi’s artworks and the taste of their coffee creations and food. I do admit it’ s subjective what milk you like, so I stick to normal coffee without any milk when I’ m there. As for food, I tried their vegetarian Flammkuchen, and it tasted excellent! The atmosphere is very cosy, and sometimes they have Live music in the evenings. Henrici also had a Barista at this year’ s Swiss Barista Championships on January 27th to 29th in Bern. She participated for the first time and chose the category Latte Art; I watched her perform and was impressed: the pressure is very high in front of an audience so well educated in coffee, and although she was nervous at first, she controlled herself and made beautiful coffee creations. 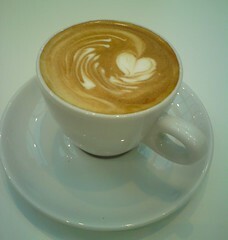 This Cappuccino was made by a Barista who reached the finals of the Swiss Barista Championships 2011. I was there to find out all about the best coffee and was amazed by the variety of creations presented there. Coffee is such a complicated field of expertise, you can have thousands of different blends, created with coffee of various heritages, some mixing Arabica and Robusta and some emphasizing that the best coffee is authentic. The roasting process is very delicate, and also there preferences vary; some people like a dark roast, others prefer a lighter taste. 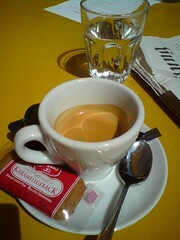 It’ s key to always consume your coffee when it’ s freshly roasted, and store it at a place not exposed to the sun. You should only grind as much as you can consume within the next 20 minutes. The cup of this Cappuccino says it right: “freshly roasted”- and it’ s also been in beans until a minute before the coffee was running into the cup. The taste speaks for this procedure. 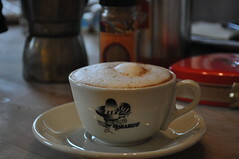 This Cappuccino was made with normal milk, unfortunately many cafés don’ t offer lactose free alternatives – yet. I hope this will change soon, after all there are a lot of people who are allergic to lactose. 8/10 Stars for the Cappuccino! For almost four months I haven’ t drunk any normal milk now and I’ m getting quite used to drinking pure coffee-if the coffee is good, that is. LA STANZA has a magnificent atmosphere and a real italian charm, and it also radiates from the italian owners that work there. 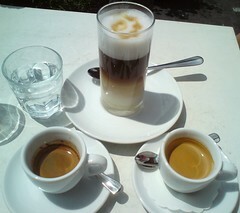 7.5 Stars for the caffé and the Latte Macchiato. Henrici’ s Baristi had the opportunity to create their own very special winter coffee speciality. 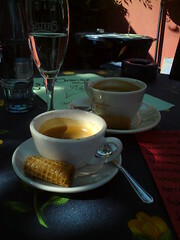 I tried them with my friend Lydia; she and I did our first cafe review many years ago, long before Caffe Amore existed. Back then we had a dreadful experience with the waitress of the Cafe we reviewed. 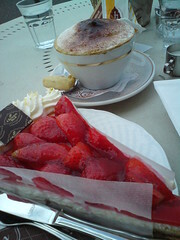 She brought our Cafe Melange and we had to pay before we got a chance to try the coffee. It was overly expensive and, as we soon found out, they served horrible coffee. I never went there again. Fortunately, our experience at Henrici was nothing like the first one at that dreadful café. I took her here because I knew I could rely on team Henrici to make our second coffee experience together a positive one. And I was not disappointed. 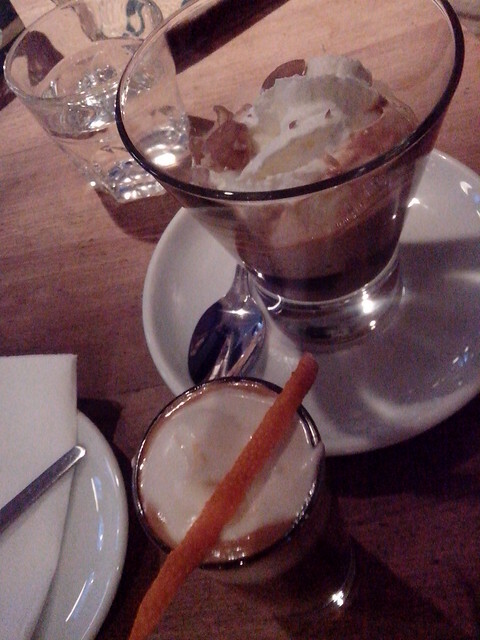 I had Irina’ s Castagnetta, which consists of Espresso, chestnut puree, whipped cream and chestnut pieces. The only thing I missed there was the instruction to stir before drinking it, because the chestnut puree is at the bottom. If you drink it without stirring, the upper part is mainly espresso and whipped cream, and the bottom is too sweet. If you stir, the mixture is well-balanced. For someone who likes chestnut, like me, the drink is perfect in winter! 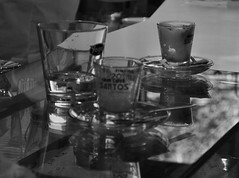 Lydia had Sandra’ s Power Shot, with Hazelnut Liquor, Espresso and topped with Whipped Cream, served in a shot glass. Lydia awards it with 8 stars, and I can only agree on Irina’ s Castagnetta.